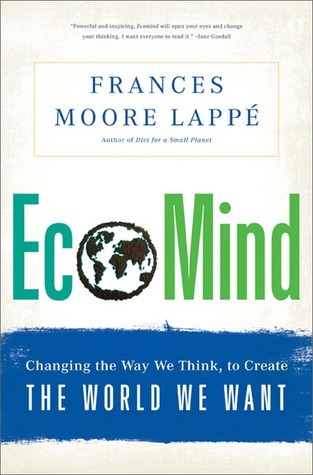 Our next bookclub will be to discuss ‘EcoMind’ by Frances Moore Lappé on Friday 27th June 2014 starting at 6.30pm at the Bridge Hotel. Pay £5 (£3 concessions) on the door for entry and chips. We have chosen ‘EcoMind’ because it will move us on from the focus of recent books (ecological and technological problems and solutions to sustainability issues), to how people think about them: anthropology and neuroscience. Following our last discussion about ‘The Burning Question’ we felt that this would be a good avenue of exploration – many of the tools are out there to make progress, but how to make it happen? Lappe argues that the biggest challenge to human survival isn’t our fossil fuel dependency, melting glaciers, or other calamities. Rather, it’s our faulty way of thinking about these environmental crises that robs us of power. She dismantles seven common “thought traps”—from limits to growth to the failings of democracy— that belie what we now know about nature, including our own, and offers contrasting “thought leaps” that reveal our hidden power.